Well, the first month of 2019 is over and done with. It was a slow-moving month, but now I can't believe we're basically halfway through February. Time is weird as an adult. Anyways, I feel pretty good about a solid five books in January, and I'm well on track to meeting both my Popsugar reading challenge and Goodreads challenge goals. 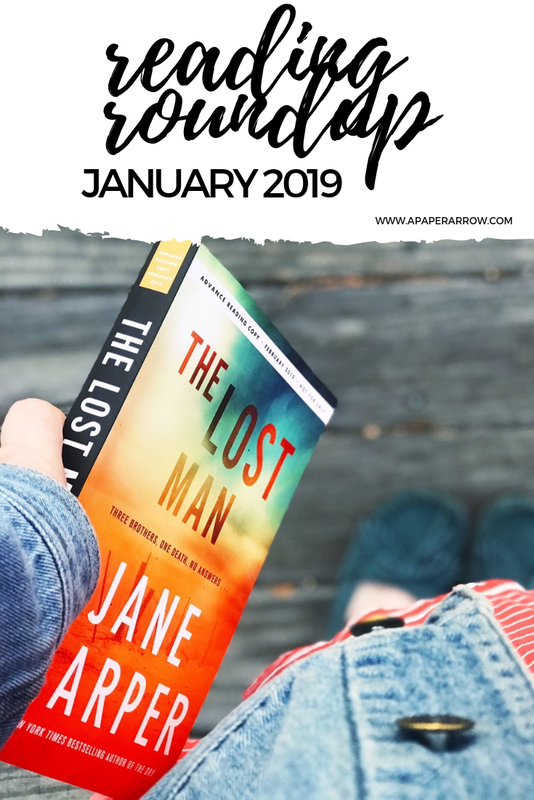 I didn't really love any of the books I read last month - it was pretty mediocre for me, but The Lost Man has been my favorite so far. Brief synopsis: The story is about Eddie, a man who witnessed some pretty terrible things as an adolescent. Growing up, he and his friends would leave messages to each other in chalk, until one day - the chalk leads them to a terrible discovery. The novel switches back and forth between Eddie's childhood in the 80s and his adulthood in 2016, the story weaving together through the timeline and each chapter. Overall thoughts: This book was pretty graphic in a multitude of ways. The story was kind of twisty, but I felt there was too much left unanswered. Tudor's writing was strong, and the story reminded me a lot of It, but without the supernatural factors. Full review here. Brief synopsis: Told from multiple perspectives, this novel follows Lisa, single mother of 16 year-old Ava, and Lisa's best friend Meredith. They all have secrets to hide. Lisa is overprotective of Ava, and becomes anxious at the slightest inconvenience. She begins to slowly unravel as clues from her haunted past begin popping back up. Meanwhile, Ava is chatting with an older man online and hiding it from everyone, including her friends. Meredith, who's always calm, collected, and put-together, has secrets of her own. And literally no one is talking to those who are closest to them. Overall thoughts: I loved Pinborough's last one (Behind Her Eyes), but this this one just didn't do it for me. There was some pretty rough child violence centered in the story, and it was pretty sickening to be honest. The characters were unbelievable, but the twists kept me on my toes. Full review here. Brief synopsis: The story focuses on Emily, a medical intern who relocates from the Carolinas to Baltimore to complete her residency at a Catholic hospital. Though her father is a Southern preacher (not Catholic at all), Emily prefers to choose science and logic over religion. New to the area, Emily quickly dives in to friendships with a slew of quirky characters, including her new roommate Norton, and an odd old man named Frank who lives next door. Frank immediately gifts her with a pendant, urging her to not take it off once she wears it close to her heart. Thinking the man old and senile, she wears the pendant briefly and after taking it off a variety of bad things begin happening all around her. But they can't possibly be related, right? I mean, how much power can a simple pendant have? Overall thoughts: Even with a cast of quirky characters, and more of them LGBTQ than not, this novel fell short. There was a ridiculous amount of fat-shaming and classism. I couldn't get past those things to really enjoy the story, which could've been fun, southern-style fiction with a twist. Full review here. Brief synopsis: The novel follows Jess, a struggling makeup artist living in the city and trying to do right by her family. When an opportunity arises for her to make some significantly extra cash by entering a research study, she jumps at the chance. After some preliminary questions, she's offered a chance to proceed further into the study for even more money. Only the study isn't what she expected - she gets in too deep, in too personal, and she's not quite sure anymore if entering the study was a good idea. Overall thoughts: This one was twisty, as expected, and it kept me engaged more than The Wife Between Us did. The plot was different than a lot of other stories in the same domestic thriller featuring women genre. Kind of gave me some You vibes. Full review here. Brief synopsis: The story follows 17 year old Casey, who at 7, witnesses her father’s death through his eyes as a vision. Those visions continue to happen throughout the next 10 years, not only for close friends and family, but geographically close folks. So when a serial killer shows up in the small Georgia town Casey lives in, the visions become increasingly more violent until Casey herself becomes a suspect. Overall thoughts: This story was written when the author was 14 and that's apparent. The writing is messy, the dialogue is confusing, and a lot more editing should have been completed prior to publication. But the plot-line is super interesting, and the book had a lot of potential. Full review here. Brief synopsis:The story focuses on brothers Nathan and Bub, who find their third brother - Cameron - dead in the outback desert right on an urban legend's grave marker. The death is unexplained and mysterious, but foul-play doesn't seem to be involved. So what happened to the brother that was so loved by the community? Overall thoughts: I really enjoyed this domestic crime thriller set in Australia. It was written so well I was able to forget I was reading a thriller and just really get invested in the characters. It was definitely different than what I was expecting, though some of the resolutions seemed a bit unbelievable to me. Full review here. 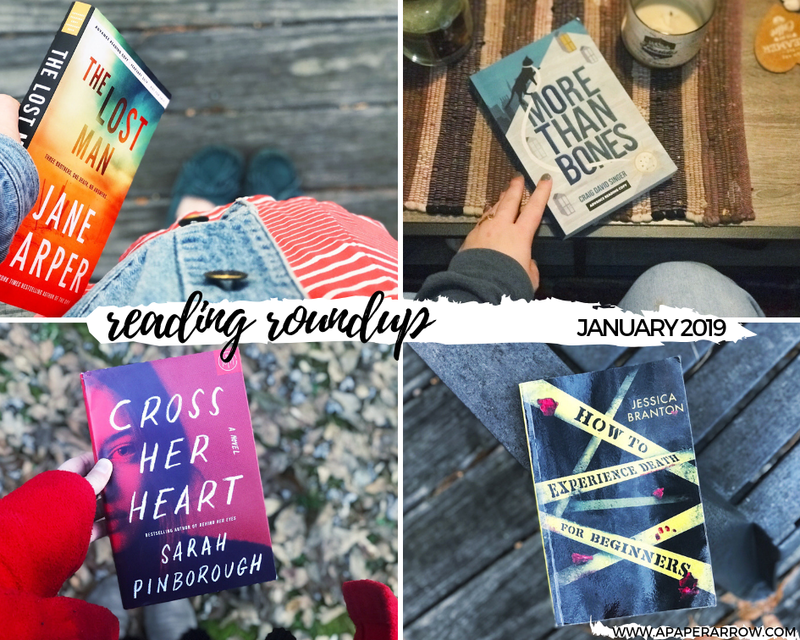 What did you get around to reading in January? * denotes I received a copy free in exchange for an honest review. All opinions are 100% my own.